Parts: 117 styrene parts, 15 clear styrene, 4 rubber tires, 3 metal axles. Molding Quality: : 5 - no flash, no sink holes, but mold seam lines on every piece, and the plastic is hard to cut cleanly from the sprue. My sister visited from England recently and I asked her to bring me an Airfix Shaun the Sheep Landrover kit. Boy, was the box big. Inside you get three bags of parts (clear parts are separate) and 14 small pots of Humbrol acrylic paints, three brushes and a tube of glue. You also get a full color instruction booklet. First off, let me answer two questions you are probably asking yourself. Question 1: Who the heck is Shaun the Sheep? 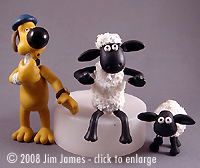 Shaun made an appearance in Wallace and Gromit's third short, “A Close Shave.” Aardman then created a series of kid's shows based around Shaun. More details here and YouTube has a few selected episodes. Question 2: Why on earth did I want this kit? I've been an Airfix fan for a very long time and have really enjoyed their Wallace and Gromit kits. Frankly, this was something different that caught my interest and who could resist a model kit that includes three naughty pigs. 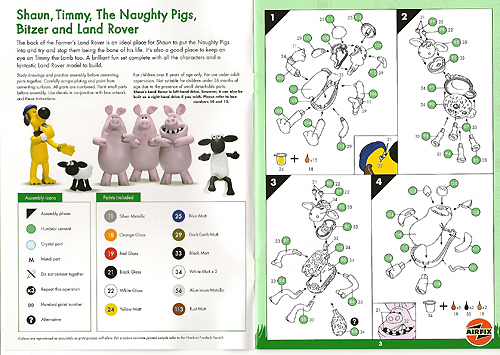 You get a 1/12th scale Landrover and figures of Shaun, Timmy (a smaller sheep), Bitzer (the sheepdog) and the three Naughty Pigs. 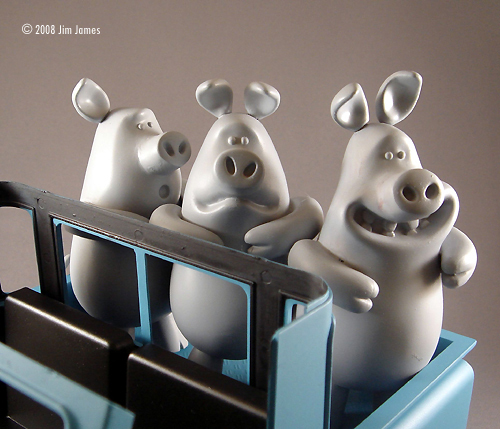 The kit assembles so that Shaun is driving and the pigs are standing in the back. The Landrover has big rubber tires, metal axles, steerable front wheels and the option for left or right hand drive (huh?). It's a pretty simple kit with nice detail (the side and turn lights have separate bulbs and clear light casing. Warning to modifiers: this Landrover is not a scale replica of any particular Landrover. You also get a bunch of paints - none of which work for the pigs, Bitzer or the Landrover (although Airfix does provide a mix menu for the colors of the pigs and Bitzer). 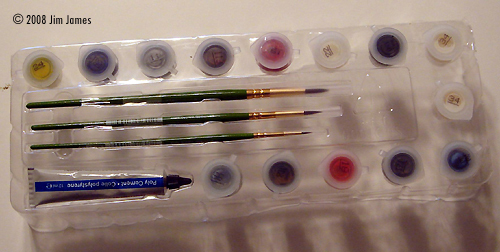 I plan on matching and/or mixing Testors enamels to match colors. There are a few pictures of the actual Landrover but all seem to have slightly different shades of blue. 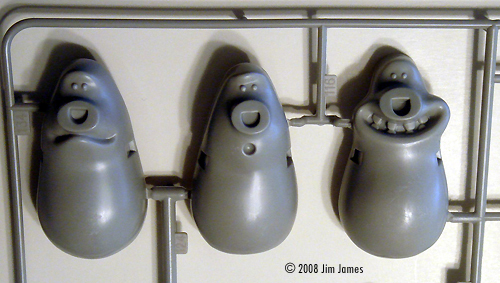 All parts have mold seams which need to be sanded off. Airfix plastic is a little strange - slightly rubbery and very slick. This makes the seams harder to remove and the parts harder to hold while you're doing it. Other than that, the parts fit is very good with minimal sanding around the joints. And watch out for those sprue attachment points. Even with a sprue cutter, I got very untidy cuts that still left marks in the plastic after sanding. 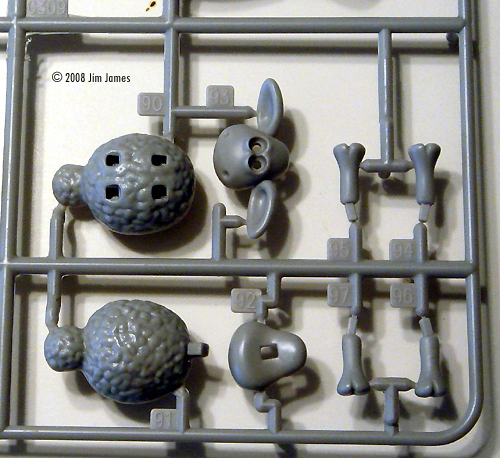 Plus, the sprue attachments weren't always sensibly placed (on the sides of the sheep eyeballs, for example). Both the Shaun and Timmy parts breakdown make painting very easy. Even the eyes are separate. 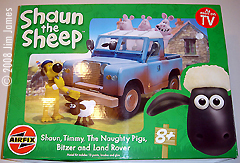 Shaun comes with his very bushy tail but since he's seated in the Landrover, the tail gets in the way and has to be left off. This is a little strange because the leg positions mean you can't do much else with the figure so the tail could never be used. Both Shaun and Timmy have a sheep wool texture surface with a flat area where the top and bottom body halves join. This looks really bad. I tried several methods of making the coats more wooly and finally decided to paint the sheep white (duh), slop on some Elmer's white glue and dip the sheep in artificial snow. Dust off the excess, mist with flat white and Dullcote and, voila, wooly sheep with no seams. Bitzer goes together easily and the parts breakdown makes painting easy. Airfix provides a mix ratio to get the right color but I airbrushed with a mix of Testor's Sandgelb and Testor's Deep Yellow. The white wristband has two blue stripes which I made with a decal. The watch should be a dark brown with a brass buckles and watch base. The face is white with detail (decal again). I plan to put a spot of future on the face to make it look like glass. These are cute! There's some work required to remove the seams on the bodies and around the (separate) snouts but otherwise they go together easily and are all one color (again a mix ratio is provided). I plan on using Testor's Piping Pink with a dash of purple. This goes together really nicely. The paint guide is pretty sketchy and Airfix doesn't provide you with a color match. The plastic color is reasonably accurate and I matched it using Testor's RAF Azure Blue with a touch of Humbrol Satin Garter Blue. The interior has to be assumed to be black but will be dirtied up accordingly. All pictures of the Landrover show it to be very dirty. I plan to use pastels and rust to dirty the chassis and body before adding simulated mud (still working on this). As mentioned earlier, you can build the Landrover with left hand drive. 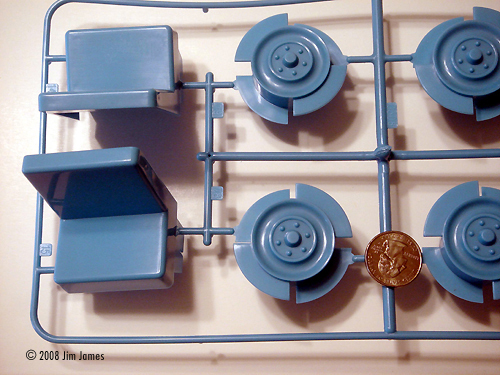 Airfix even provides two separate dashboards. Two questions on this. A) Why include it? It's a British Landrover and it's a right hand drive in the show! And B) How does the driver see out the windshield? 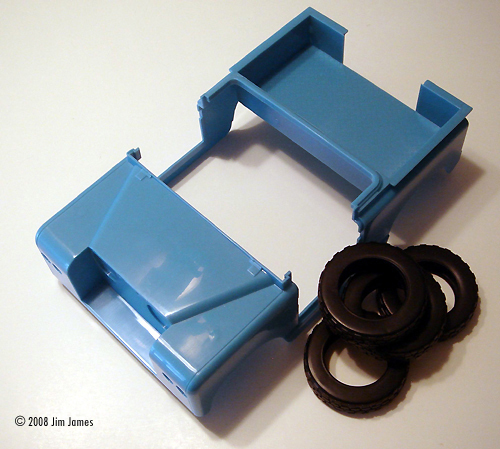 The kit comes with one windshield wiper, molded on and on the right side. Incidentally neither dashboard has any dials or switches. Sounds like a job for Mr. homemade decal maker again. This model really needs a base which will probably comprise a rather muddy track. Although they all stand freely, I will probably pin Timmy and Bitzer to the base and the pigs to the Landrover (they don't fit comfortably in the back). 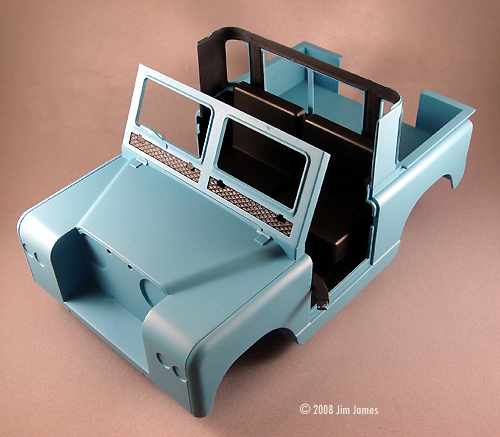 This is actually a really nice model and what makes it so interesting is the opportunity to use unusual techniques - namely the sheep wool and the ultra weathering of the Landrover. However, the complex paint mixes for Bitzer and the Pigs and the absence of instructions on how to really dirty up the model mean that it's not a great kit for kids and the subject matter is not really attractive to adults. Airfix has another Shaun kit (a tractor with Shaun, Timmy and Bitzer) that probably cuts in to sales. Look for these in your local bargain bin in about 6 months. Unless the pigs make it big on TV. Many thanks to my sister Pam's wallet for providing the review samples. Manufacturers and retailers, interested in getting your wares reviewed and publicized on a site averaging 3500+ readers a day? Contact us! This page copyright © 2008 Starship Modeler. First posted on 5 November 2008.